Having worked through fifteen of the 104 boxes of the B. Z. (Ben Zion) Goldberg Papers, I can definitely say that these papers are unique in many ways. The primary reason being that much is written in the Yiddish language. B. Z. Goldberg, born in 1885 in Olshani, Russia, wrote for and edited the Yiddish-American newspaper Der Tog, and was the son-in-law of Sholem Aleichem (1859-1916), the famous “Yiddish Mark Twain.” Goldberg wrote exclusively in Yiddish, a language native to Eastern European and Hasidic Jews. This collection takes us to a time when Yiddish was a vibrant and prominent international language. In addition to the Yiddish-American newspaper Der Tog, Goldberg collected and wrote for other newspapers including Forverts, Neye Presse, Yidishe Kultur, and Morning Freiheit, copies of all which can be found within the collection. Today, however, the only Yiddish newspaper, online or in print, that I am aware of is Forverts, a sad indication of the decline of Yiddish in the press and the use of Yiddish in general over the last 50 years. If one wants to go back to a time when Yiddish was more alive, the B.Z. Goldberg papers is the place to go. 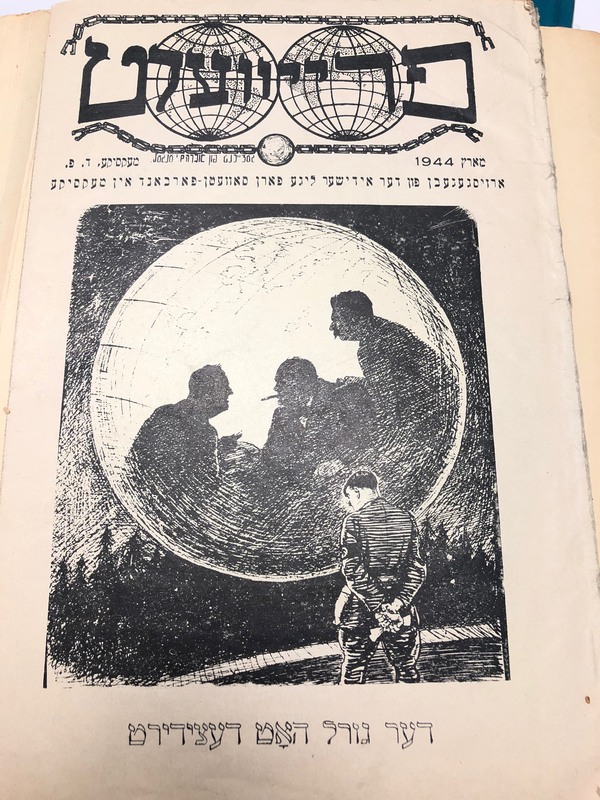 In the collection, I found articles, in English and Yiddish, about Yiddish Theater in America, Sholem Aleichem’s songs and writings, Israel and the Middle East, the United States Presidency, and Russian Jews, as well as a published Yiddish magazine from the end of World War II. These topics interested me not only because I am a history major, but because I have a passion for learning about World War II, and the state of the world during the Cold War. Yiddish theater in America was clearly of interest to Goldberg and he collected and kept articles about the topic which were written in both English and Yiddish. 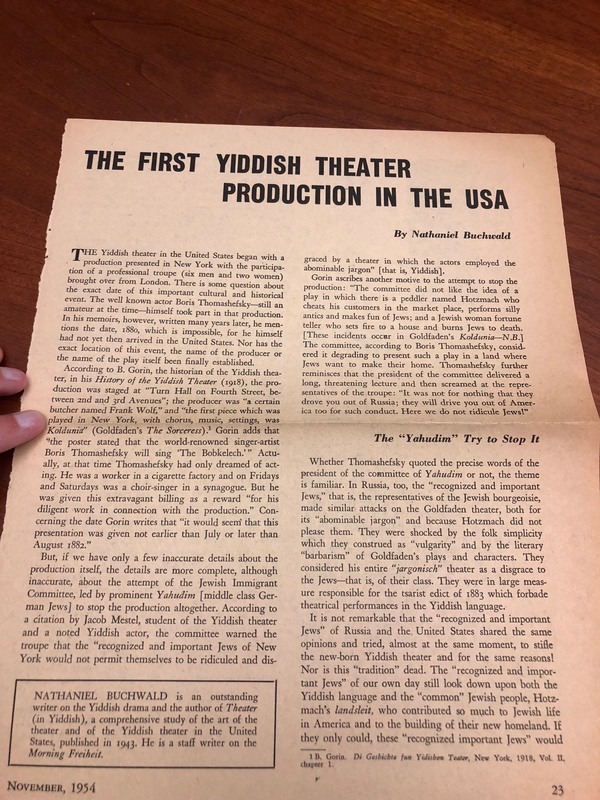 Pictured below is an article called “The First Yiddish Theater Production in the USA” by Nathaniel Buchenwald which describes the debate of where and when the Yiddish theater was born in the United States. Some of the other articles described the places where the Yiddish theater writers would meet in New York City over Jewish food, which allowed an interested scholar (me!) to discover the geographical centers of Yiddish theater culture. These articles showed the cultural aspect of Yiddish and how much it affected Jews in the United States as well as those in Eastern European countries. Many of the articles about Yiddish theater also talked about Sholem Aleichem’s writings being transformed into plays such as The World of Sholem Aleichem. Goldberg’s devotion and admiration toward his father-in-law Sholem Aleichem is clear as there are many articles on Aleichem’s work and him as a person in the collection, including some articles written by Goldberg himself. In addition, there are rare and singular writings by Aleichem, providing a new perspective on the man best known for writing the book that inspired the musical “Fiddler on the Roof.” One such example is Aleichem’s “Off for America,” a section from his “Adventures of Mottel the Cantor’s Son,” which was printed in The World Magazine in 1916, just a few months before Aleichem’s death in May of that same year. 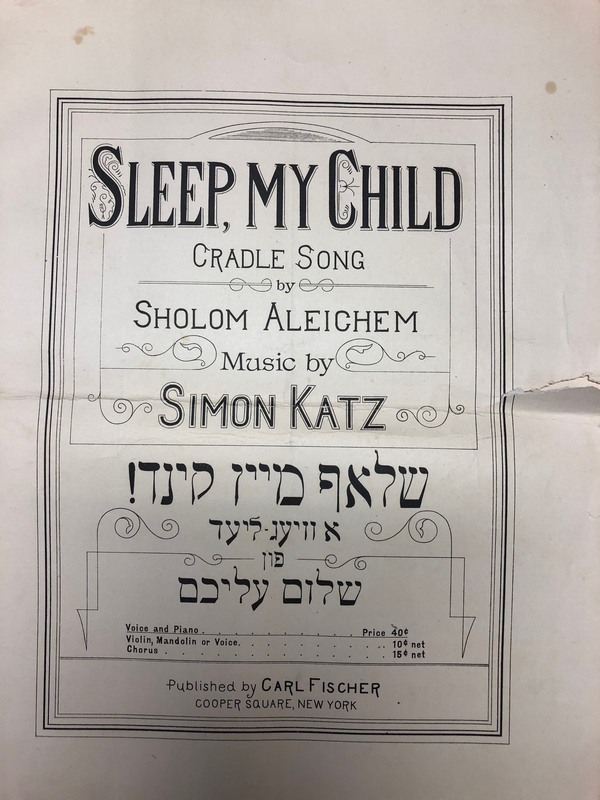 Another example is this edition of the song titled “Sleep, My Child,” written by Aleichem, with music by Simon Katz. The song was published in 1917, and this edition contains most of the sheet music in both English and Yiddish (transliteration). Yet another example is an edited draft for the English version of Aleichem’s set of ten short stories, Tevye the Milkman. The story, “Tevye Blows A Small Fortune,” shown here tells the story of a cousin who stole from Tevye saying he would make the money grow, when, in fact, he actually spent it all and gave none back to Teyve. Goldberg’s interests were diverse and he collected across the board–from his father-in-law’s writings to global events and politics. This magazine, Freyvelt was published in March of 1944, just a few months before D-Day and the end of the war. 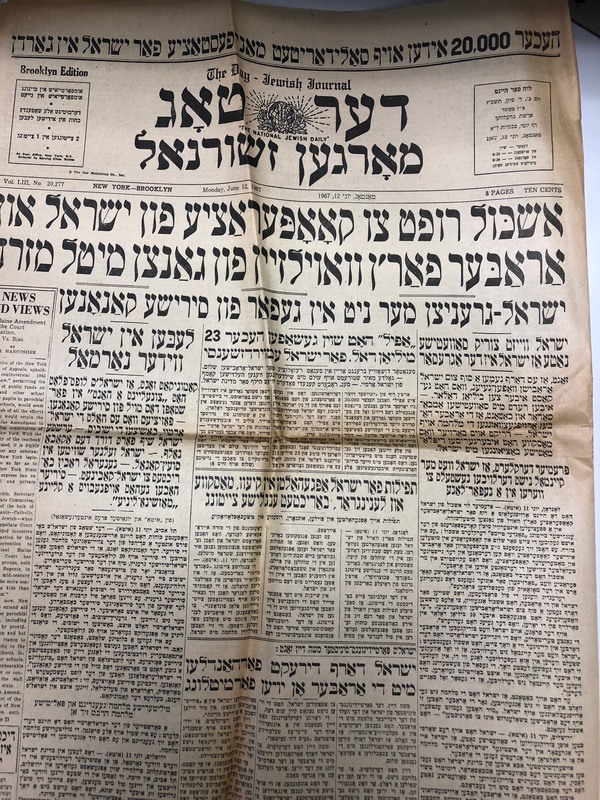 Jumping some twenty years into the future, Goldberg collected an import edition of the Yiddish-American newspaper Der Tog, which reports the logistics and casualties of the Six Day War two days after it ended in 1967. The B. 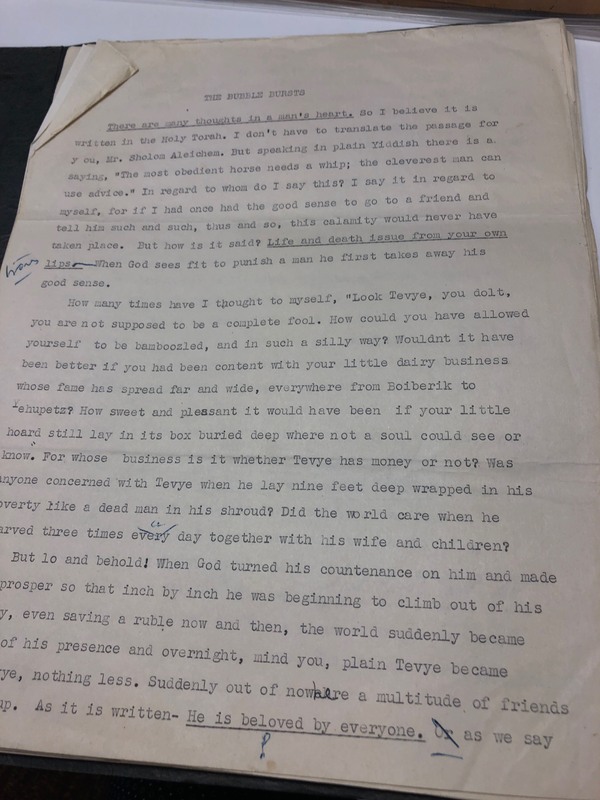 Z. Goldberg papers are valuable for many reasons, including the celebration of the Yiddish language and the resilience of the Jewish culture through a tumultuous century. We can speculate that that deep-rooted culture, kept alive by the works of Sholem Aleichem and a shared language, provided strength to the Jewish people through the struggles of the Holocaust. Today, when Yiddish heritage is obscure and nearly forgotten, it is important to recognize the value of this material in a historical context and its importance to the international Jewish community. This entry was posted in Uncategorized by Hope Jones. Bookmark the permalink.